They aren’t wrong; it was nearly impossible to take a bad photo at Cersaie. 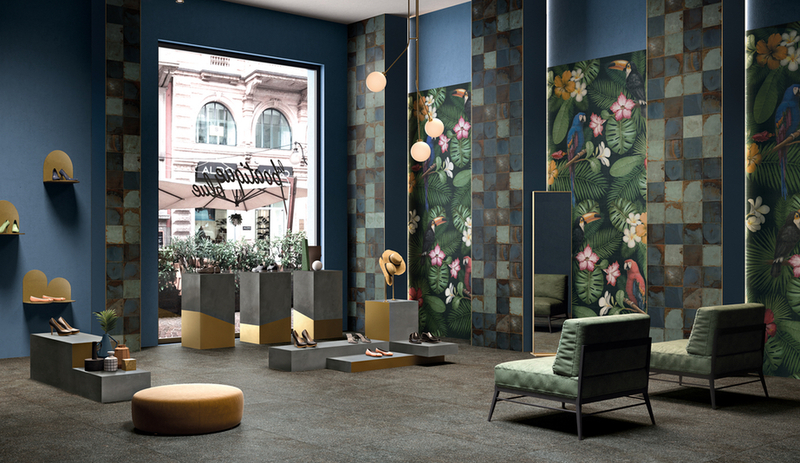 But amid Cersaie’s clear consistencies – wood-look, marble-look and floral-inspired tile abounded – a number of booths, installations and manufacturers stood out. Here’s what was good – and what was different. While Imola’s fluorescent signage – declaring “I tile U so much,” illustrated with a yellow heart – drew plenty of photographers, so, too, did a number of decorative tile-minded launches. 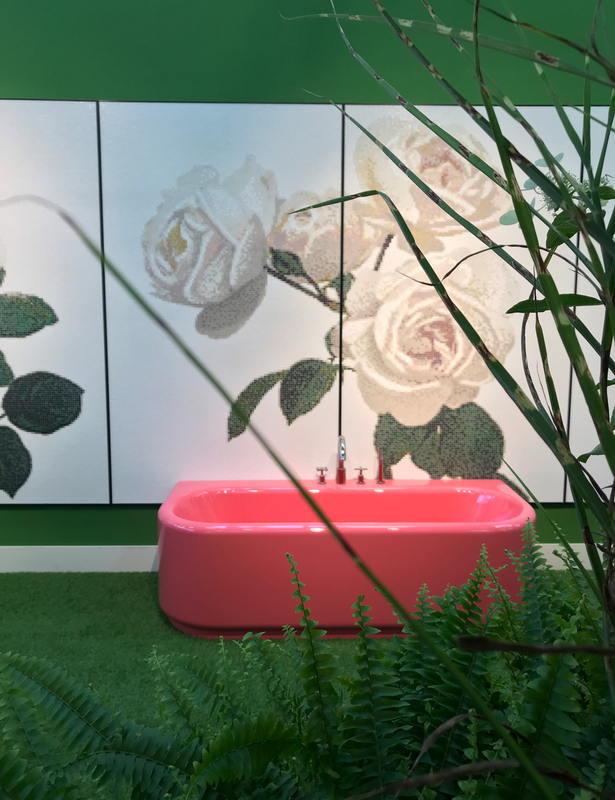 A quick scan of the #Cersaie2018 hashtag on Instagram reveals the selfie-drvien popularity of ABK’s soon-launched Dark Edition (above), which clustered strawberries, flower blooms and butterflies. It’s an expansion of the brand’s Wide&Style catalogue, featuring large-format slabs, reaching 160 by 320 centimetres. 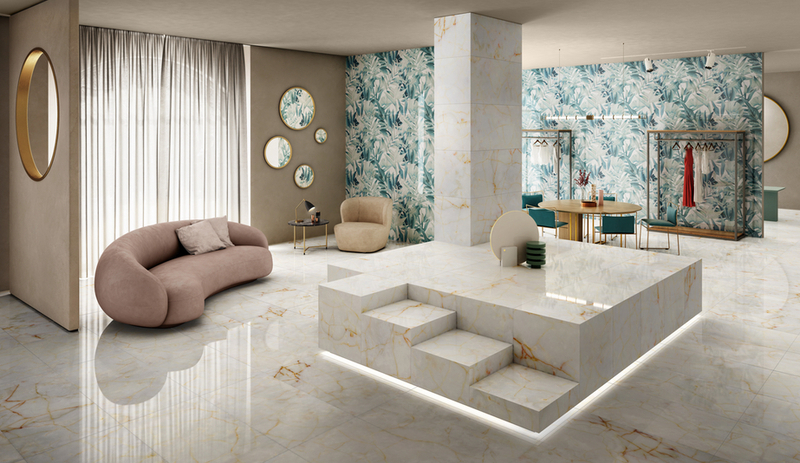 Elsewhere, gold inserts – on the marble-look Majestic Collection by Valentino by Piemme (above) and Lea Ceramiche’s Concreto, to name two – drew plenty of eyes. The luxe Majestic, with six marble looks and 150 different graphics treatments, was especially stunning. 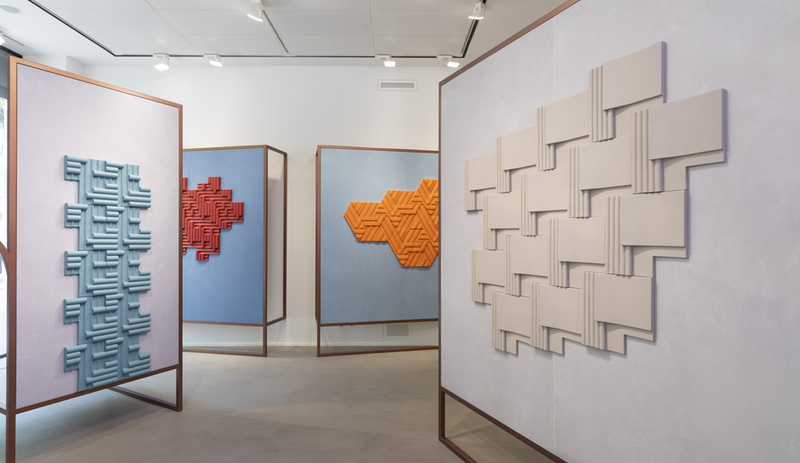 Elsewhere, the latest additions to Sicis’ Vetrite Gem Glass – which placed a geode-like polymer film between two layers of safety glass, resembling topographic views of Mars – Arteceram’s colour-blocked bathrooms (above), and the collaborative booth between Agape, Matteo Brioni and Wall&Deco drew cellphone-toting crowds. 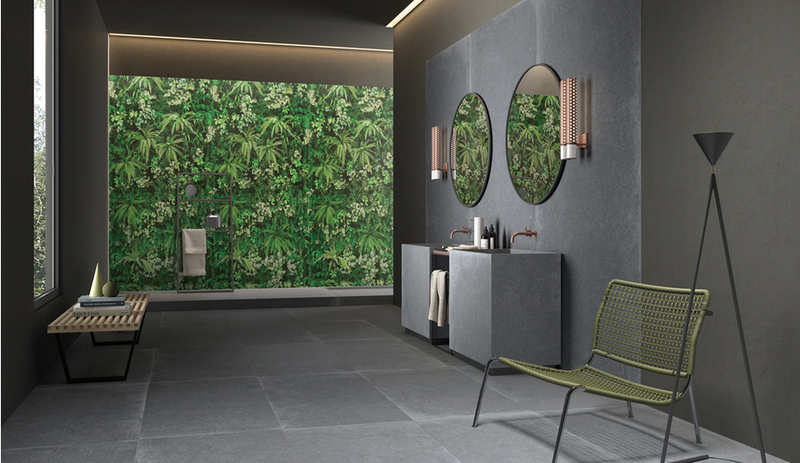 The sustainability-minded at Cersaie like to remind visitors of ceramic tile’s status as a natural material, but Il Giardini Segreto celebrated its earth-bound roots more artfully. 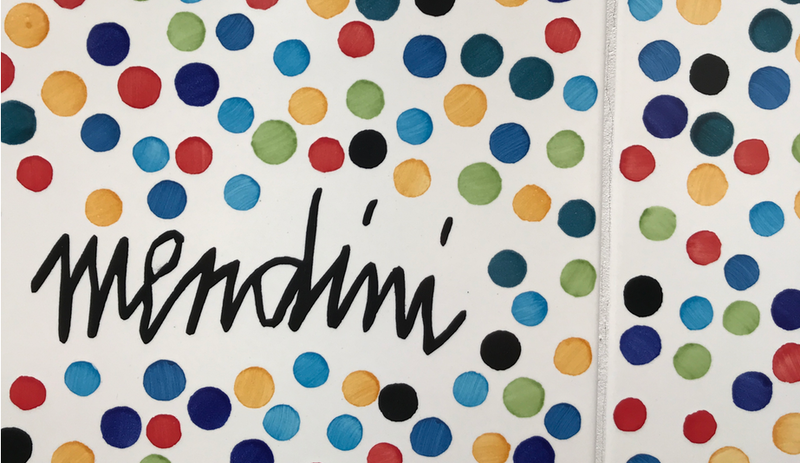 Inspired by a French garden, the group exhibition showcased 20 pieces of mosaic-tile art by Kiki van Eijk, Tricia Guild, Tord Boontje, Carlo Dal Bianco, Marcel Wanders and Nendo (whose Qi bathroom for Scavolini was also showcased). 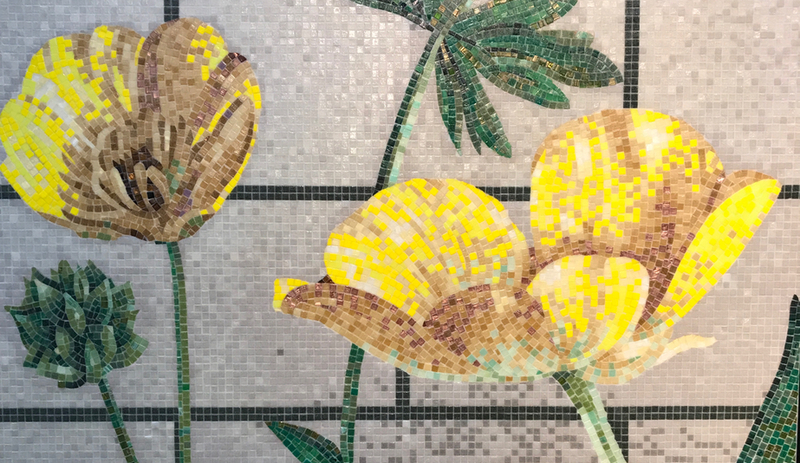 Using small-format Bisazza Cementiles interspersed with Swarovski crystals, the works depicted cornflowers, poppies, roses and pansies interspersed with lush potted plants. Designed by French designer India Mahdavi, Il Giardini Segreto provided a lush – but still immaculately tiled – respite from the bustle of the trade floor. 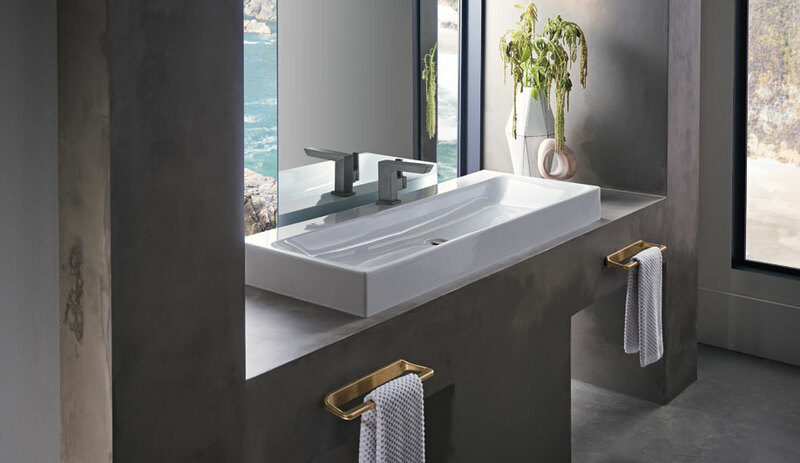 Each of Emilgroup’s brands – Emil Ceramica, Ergon, Level, Provenza and Viva – unveiled launches at Cersaie 2018. And each had their own twist: Emil Ceramiche unveiled the Chateau collection, inspired by the ducal art of Burgundy. Ergon unveiled granite, Ceppo di Greé and wood-look surfacing. Level focused on technical, large-format slabs. And each launch was displayed in an unforgettable booth. For 2018, Emilgroup played with perspective and scale: one booth’s entrance was marked with an oversized gitoni table. Level’s booth (shown above) affixed full-sized furniture, from a dining table to a marble desk, to booth walls. Provenza’s booth culminated in a room with roots emerging from its ceiling, as if standing beneath a tree. 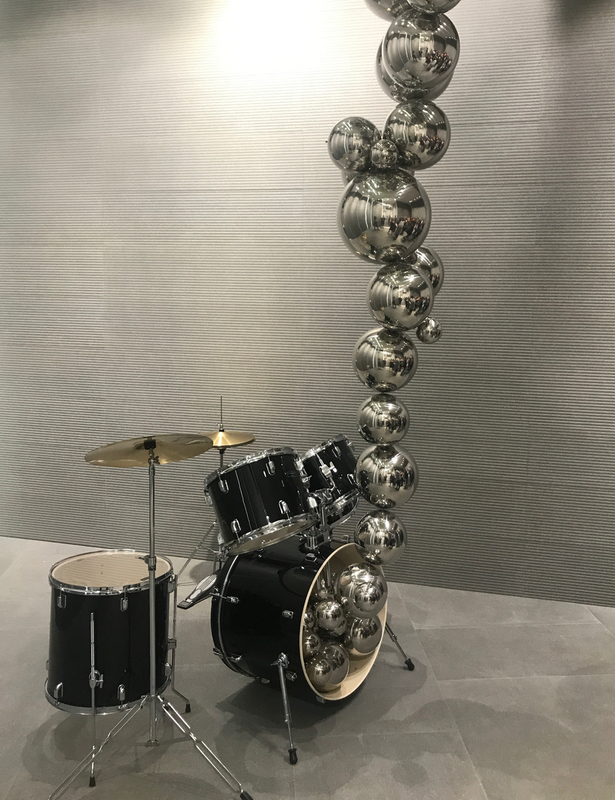 Viva, meanwhile, featured metallic bubbles emerging from a drumset, a piano and other musical instruments. 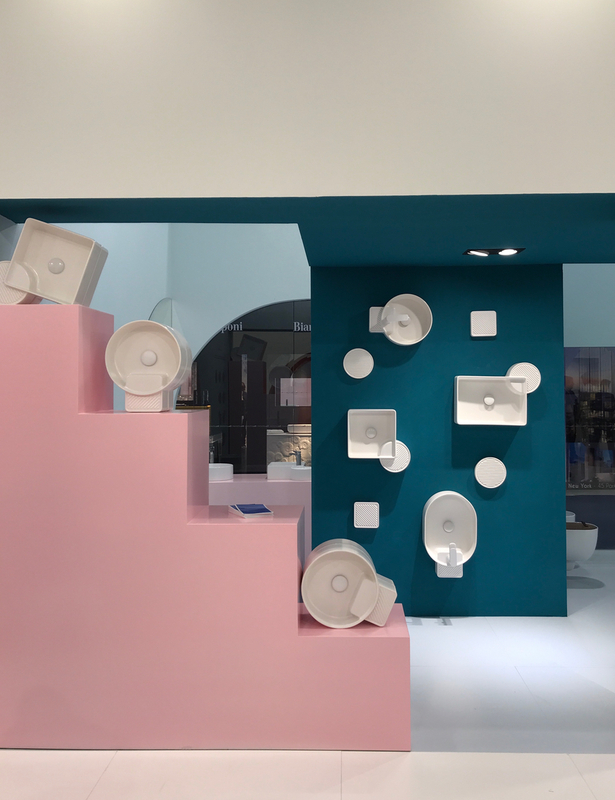 Emilgroup’s dedication to surrounding their product with eye-popping surroundings shouldn’t come as a surprise: their Cersaie displays wowed us last year, too. 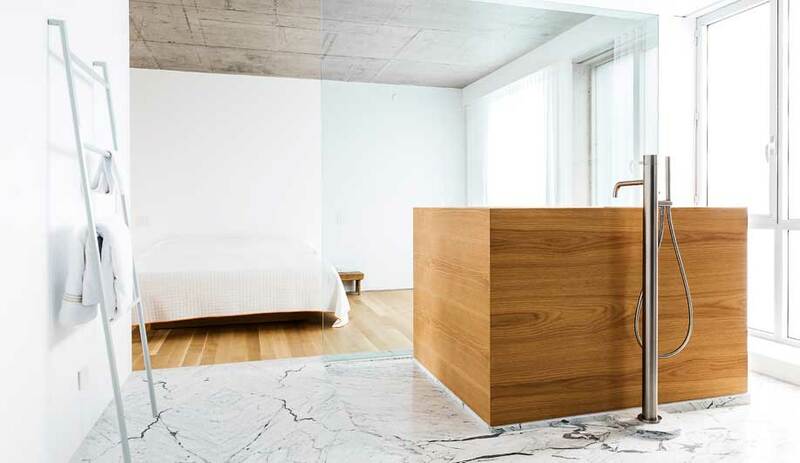 After last year’s edition of Cersaie, Azure hailed the fresh aesthetic of Italian ceramic startup 41zero42. And the young company continues to impress, filtering tile’s major trends – wood-look and floral patterns, for example – into a modernist-verging-on-psychedelic aesthetic. Though much of their booth centred around the launch of Sunday, it also displayed 41zero42’s avant-garde, mix-and-match collections. 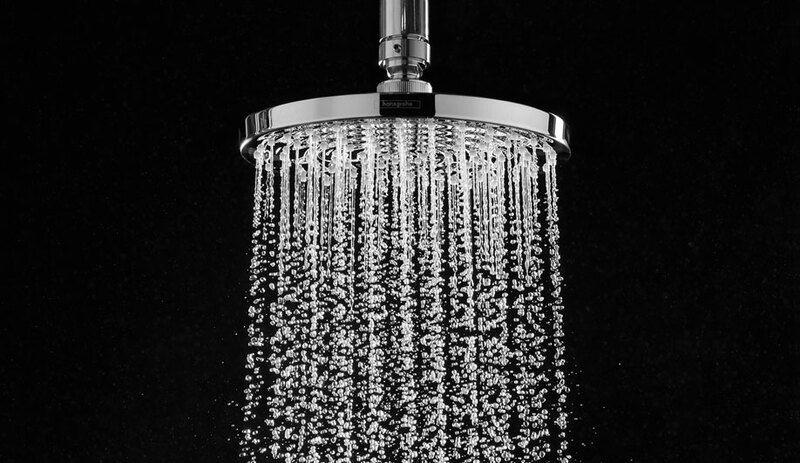 Florim’s Rilievi tile was designed by Zaven. 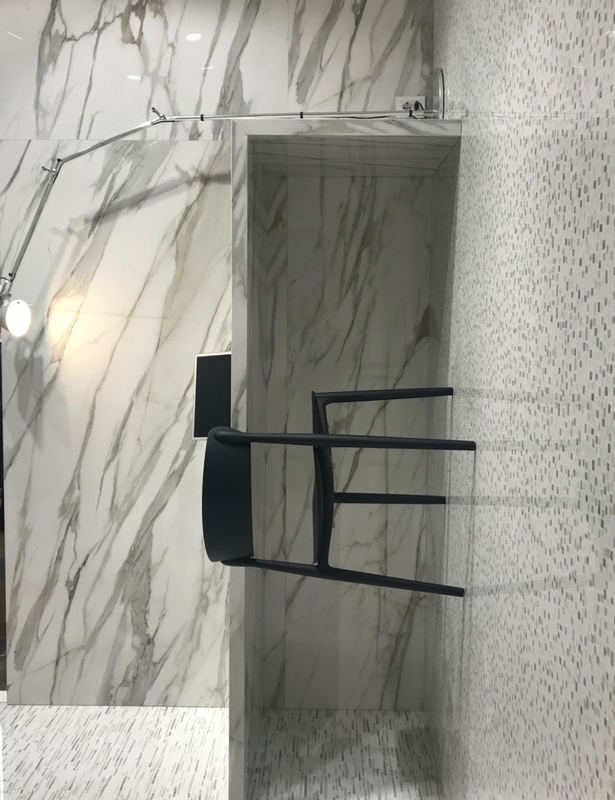 Thanks to still-improving advancements in digital printing, many exhibitors showcased the shapeshifting ability of tile: impressionistic 3D tile, high-resolution marble-look surfacing and textured concrete were readily available (and highly impressive) at Cersaie. Yet a number of manufacturers also used their printing abilities to showcase their lighter side – and it resulted in tile that was humorous, experimental and delightfully weird. 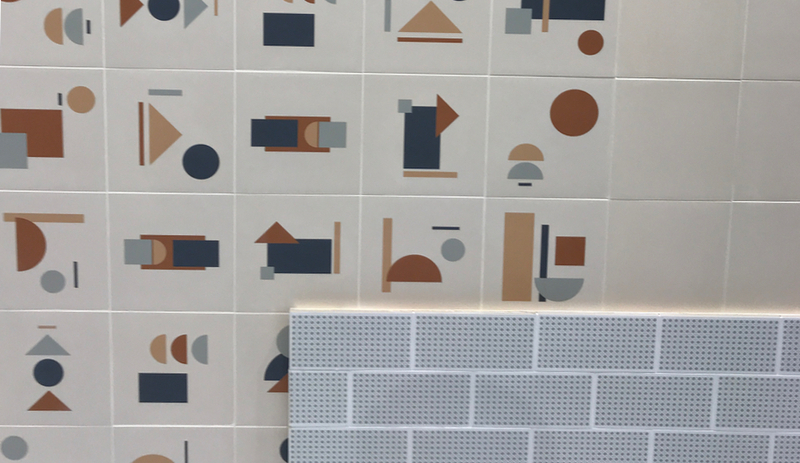 Del Conca provided one such example: steps away from their porcelain pavers – which adorn the rooftop garden of MoMA and the brand hopes will become driveway mainstays – was a collection of finely printed tiles featuring Felix the Cat. 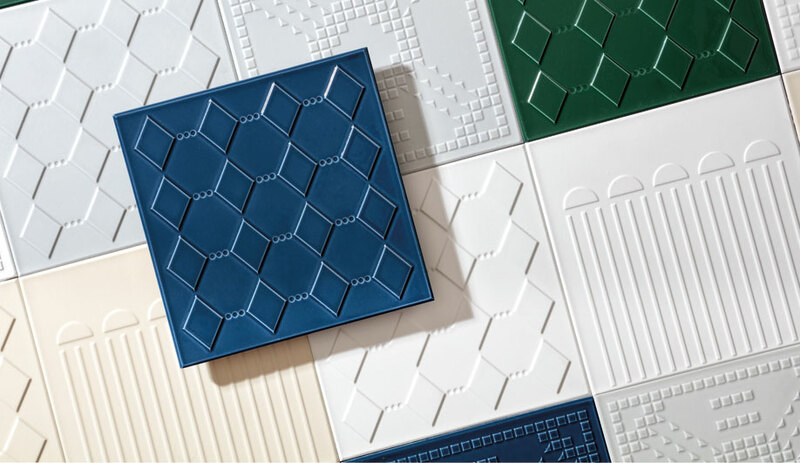 Florim’s Zaven-designed Rivieli tiles, which placed relief tiles atop larger slabs to painting-like effect, were used to create fanciful installations. Blu Ponti by Ceramica Francesco Di Maio‘s hand-painted tiles, meanwhile, added a dose of colour to the proceedings. 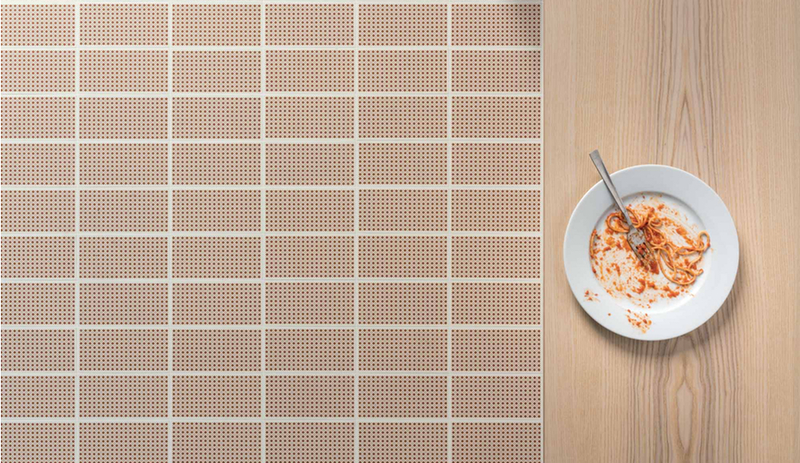 It’s a reminder that tile has many faces: it can be sustainable, flexible, beautiful, luxurious and light-hearted.